Wave Puppet is an installation translating powerful physical forces to an anthropomorphically comprehensible and safely inanimate form, a collaboration with William Tremblay. Wave Puppet is a marionette of the ocean's surface directed by the math that underlies all waves. 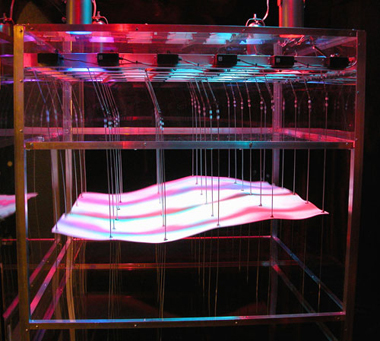 Wave Puppet is an open-framed cube containing a flexible sheet suspended horizontally. 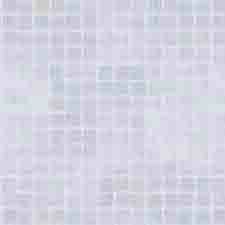 The sheet hangs from 36 vertical steel rods, evenly spaced in a grid pattern. Each rod is attached to a computer-controlled servo motor through a mechanical linkage. When a motor actuates, the point on the surface of the sheet connected to the rod rises or falls, deforming the sheet. When this motion is coordinated by computer, complex wave patterns are generated, capturing the dynamics of liquid in a purely mechanical form. Additional complexity arises from the inherent imprecision of the motors, at once enhancing the puppet's similarity to water and calling attention to its simulated nature. A motion detector signals the approach of a viewer, beginning the puppet show.